Left: 1970 blonde Living Barbie in 1970 #1799 Maxi N Midi. I had wanted that outfit as a child and as an adult it was one of the first outfits I bought. Right: 1971 Living Barbie with centered eyes in her original outfit. She is my most recent Living Barbie purchase. I pinned her sarong around her neck so she can play superheroine. Left: 1970 brunette (actually black hair) Living Barbie was my sister's First Communion doll. Barbie wears 1970's #1463 Lovely Sleep-Ins. Right: This 1970 brunette doll has her hair separated as if she had been sold with two ponytails. She is practicing her ballet moves in 1970's #1787 Prima Ballerina. The two 1970s redheads (Mattel was no longer using the word "titian") are in 1970's #1781 Tennis Team (I have only one gym shoe) and 1970's #1788 Scuba-Dos. The girl in pink wears the Sears Action Accents ski outfit, which clashes with her red hair. Note how different her eyes are. On the right is my last Living Barbie in 1970's #1464 Anti-Freezers, another one of my childhood desires. I have more Living Barbies than I do any other version of her. She used to be very easy to find. A woman I know only slightly gave me a wonderful gift several years ago--her childhood Barbie collection, and that included Action Accents Barbie. I would never have been able to afford the doll if I wanted to buy her. I've photographed them separated by hair color. 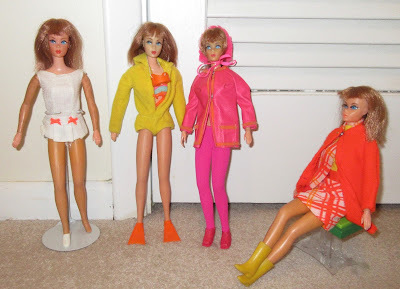 You have probably noticed the abundance of outfits from 1970 and 1971 for Barbie that either slippers, boots or some kind of athletic footwear. That's because the outfits were designed for Living Barbie's flat feet. It always irritated me when I saw pictures in doll magazines of Living Barbie in high heels or another mod Barbie or friend in one of the flat-shoed outfits. Couldn't anyone else figure this out?